We commend the people of Algeria for the protests in the last few weeks against a fifth term of office for President Abdelaziz Bouteflika. In 2014, in spite of his ill health, which made it impossible for him to show up physically to campaign, he still ran for a fourth term of office and won. However, Algerians became upset when he expressed last month his intention to run for a 5th term. They then rose in protest until he changed his mind last week. After Ethiopia in the 1930s, Algeria became the second African country to win its independence in the battle field (1954-62). Bouteflika was an officer during that war of independence, and the hero image of the National Liberation Front (FLN) which led Algeria to victory continues to be respected. If President Bouteflika has had stable health, he probably could have been left alone to continue unperturbed as president for life. But he has had health issues since 2005. Then in 2013, he was further struck by a severe stroke which seems to have ruined his health. In 2014, all his campaigning for his fourth term was done by allies, associates and surrogates. Bouteflika was rarely seen at all in public. He was said to have received 81 per cent of the votes but throughout his fourth term, Algerians were uncertain how much of the decision-making was his own and how much was done by others in his name. Algerians have not named a cabal. 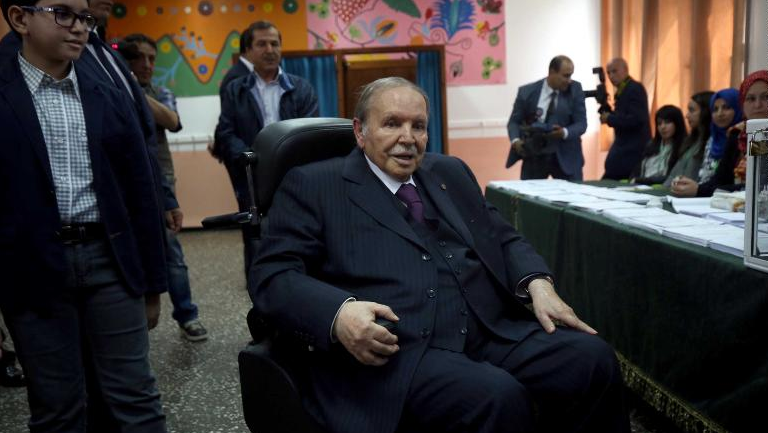 Abdelaziz Bouteflika is not depicted as a tyrant, although his political opponents would not vouch for the fairness of all those elections he is claimed to have won since 1999. He may not be the best example of a liberal democrat but he is remembered as the peacemaker who helped calm the waters and finally brought the gut wrenching Civil War (1991-2002) to an end to everyone’s relief. He proved he could be an intermediary between the Islamists and the government and brokered the two amnesties granted the Islamists in 1999 and 2005. Again, after the Arab Springs (2010-2012), and seeing what became of Libya after Gadhafi, and how Syria unraveled following the protests, most Algerians, it would appear, seem prepared to ride with a trusted old hand at the steering rather than grasp for a pie in the sky. Besides, the Algerian economy was able to provide for a restive population of youths, the country is also the third largest producer in OPEC. But the idea of a fifth term for Bouteflika was the last straw, understandably. At first the protests were ignored but within a week more than one million Algerians had taken part, and in its second week the media which had ignored them began to show that three million Algerians were in protest. Then on February 24, Bouteflika was admitted once again to the University Hospital of Geneva, Switzerland, and things quickly went downhill. The tempo of protests picked up and the president’s campaign director went to file his candidacy, even though the law required the president’s presence. On March 3, protesters called his candidacy a “provocation,” an “insult,” and a “masquerade.” Prominent Algerians joined, including members of the FLN, former ministers and mayors. On March 7, a thousand lawyers demonstrated in Algiers. Four days later, 1,000 judges issued a statement declaring that they would not supervise the April elections if Bouteflika would be a candidate. That same day, the Army Chief of Staff, Ahmed Gaida Salah, gave a speech that the army and the people had a common vision of the future. Finding no support within the establishment, Bouteflika threw in the towel, replaced the prime minister, but postponed the election indefinitely, which is curious. The celebrations in Algeria over the president’s promise to withdraw are appropriate, and Algerians deserve commendation for standing up to demand Bouteflika’s exit. It is still a peculiarly African weakness for leaders not to know when to leave. Bouteflika, counting his years from his appointment as minister of sports and youth in 1963, skipping the Chadli Benjedid years, totaled 36 years of which he was president of the Republic for 20. Term limits are set to enable a country to be periodically refreshed with new ideas and new energy to propel the nation’s progress. Longevity in power is often said to provide stability, but after a while it is often like the stability of the grave yard in which corruption and decay seize the realm and then a backward march begins. African leaders should move this continent forward, not the other way round.